I never took the time to read or listen to Michael Eric Dyson before. He became an ordained Baptist minister at nineteen, so for very nearly forty years now he’s been using words to educate and persuade. He’s very good at it. He teaches now at Georgetown University, but he has taught at many major universities around the country. He doesn’t sound like an academic; his language is salty, strong. It appears that in addition to teaching, he consults for MSNBC, has a podcast, lectures at other universities, and has been publishing lectures and books for at least ten years. Dyson explains that a sermon was the only way he could get across the information he wants to convey in this book. The sermon is not scholarly, but in vernacular. It is filled with anecdote either he or members of his family experienced. He clearly feels white folk have some things about their behaviors or their compassion to consider in the context of God, goodness, and fairness. He has a tendency to insist on superlatives and opinion (e.g., Beyoncé & MLKing are the best…ever) when his opinions on gradations of excellence don't matter. But the bigger issues he addresses are really critical to our understanding of race and the functioning of our democracy. “Whiteness has privilege and power connected to it, no matter how poor you are.” Dyson explicitly addresses the objections some white ethnics may have about their experience with discrimination being similar to those of blacks. It is not so, he says, gives many examples of how it is not so. I agree with him that white people are not going to have as hard a time of it as people of color. It has nothing to do with culture. If we do not see this yet, we need to pay more attention. In 1995 O.J. Simpson was acquitted when he was tried for murder. Many white folk didn’t understand why some black people were pleased that Simpson got off, given that he was clearly guilty. But that trial came a year or so after the trial of the police acquitted after the beating of Rodney King. Dyson takes a stab at explaining the thinking on both sides of the color line at that time. All this was twenty years ago and Dyson argues that white ignorance and police brutality is still happening. He is full of righteous anger when he says whiteness is a privilege and a shield…and an addiction. Sure it is. Dyson is blunt, and he doesn’t let up after this point. All he things he has seen that need attention are laid on the table. There is more than enough here to make anyone feel full…even overwhelmed. But he has some stake in making us understand the urgency here: it is his kids and grandkids that are in danger every day. He talks at length about the terror black people feel when police become involved. This is an important discussion for white folks to internalize. Discussion around criminality takes up most of the final third of this work. Dyson does not try to avoid difficult questions about policing, black-on-black crime, and incarceration. He wants this conversation and will provoke many listeners and readers to face their fear and their anger. Dyson asks why social engineers blast black communities for growing the seeds of their own destruction, when the same questions were not asked when crime was a problem when ghettos were filled with Irish, Italians, or Jews. This is worthwhile. 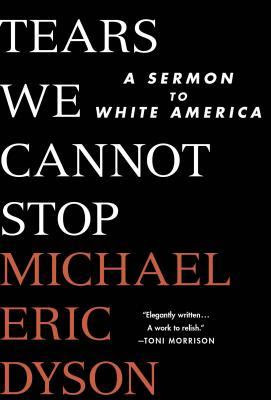 Here is a link to 45-minute WBUR Boston radio show where Michael Eric Dyson discusses the subjects in his book, but adds a few more topics, expanding his themes in response to an interviewer’s questions. Interesting. I listened to the audio production of this, read by the author and produced by Macmillan Audio. Dyson talks fast, but clearly, and firmly. One can’t mistake what he is saying: white America needs to study and imagine what it is like to be black if we want to begin to understand, begin to heal the racial divide. We may not like all the things Dyson says and yet we can still agree with him about the “plague of white innocence.” No more saying we didn’t know. He's telling it. It feels urgent.